I love notebooks. The cute ones. I'm old-school in the way that I love to write little notes. When writing an article [or blog post], I'd rather write it on paper first. 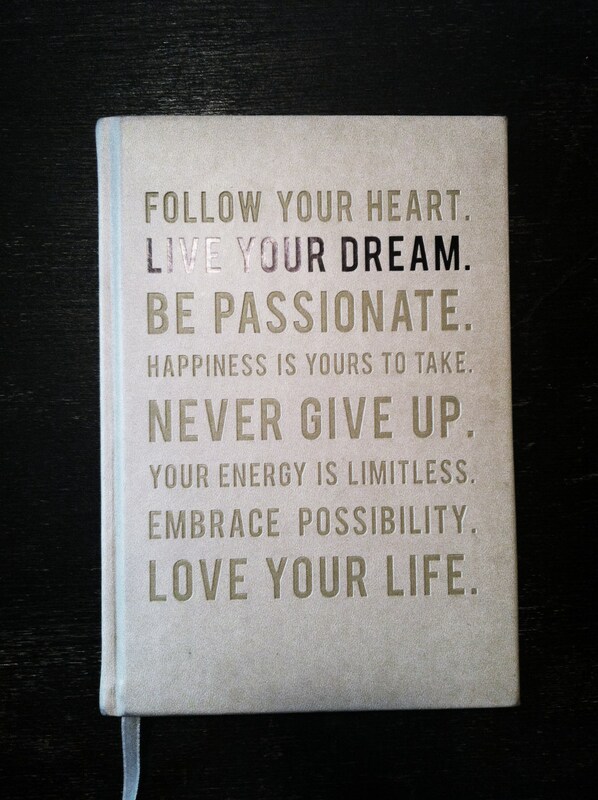 The other day when browsing some of my favorite sites, I came across this adorable and motivating journal from Urban Outfitters with the words "carpe diem" across the front. Carpe diem is a well-known Latin saying meaning "seize the day." Something about having those "go-getter" words right there in front of me when writing gives me a little more of a boost to write my best. My current journal is similar. It was a TJ Maxx purchase [for $4]! It's in my bag everywhere I go. follow your heart. live your dream. be passionate. happiness is yours to take. never give up. your energy is limitless. embrace possibility. love your life. Happy weekend! Hope this gives a little Friday inspiration on this rainy day in Connecticut. Go on out and find yourself the perfect motivational notebook. I guarantee it will put a smile on your face.